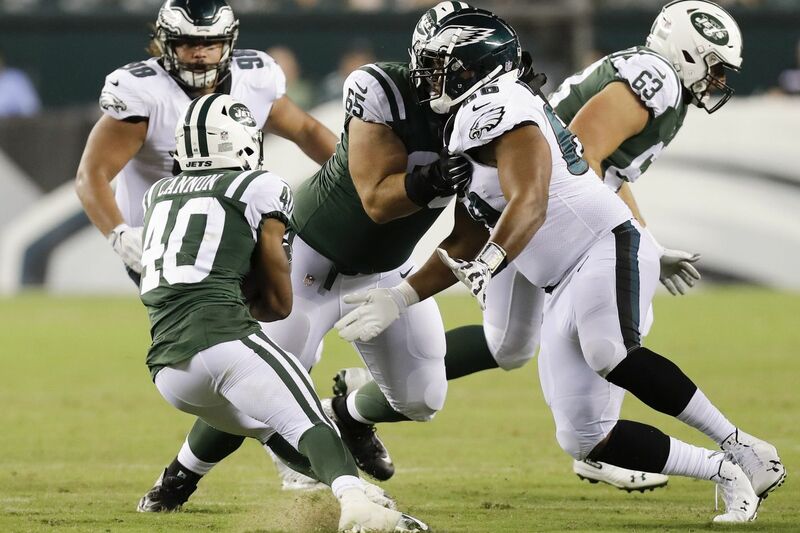 Eagles defensive tackle Bruce Hector spent a few weeks on the practice squad, but now he is back on the main 53-man roster. The Eagles on Friday brought back defensive tackle Bruce Hector from the practice squad, releasing wide receiver Kamar Aiken. The move reflected the fact that this weekend they are facing a Carolina Panthers team that ranks fourth in NFL rushing, at 139.4 yards per game, and that 34-year-old starting defensive tackle Haloti Ngata has missed the past two games with a calf injury. Eagles coach Doug Pederson said Friday that Ngata, who practiced on a limited basis this week, would be listed as "questionable" for the game. It seems possible that even if Ngata plays, his role will be limited. Earlier this week the team waived/injured defensive tackle Destiny Vaeao, who started against the Giants last week and recorded a sack of Eli Manning on one of his 28 snaps. Vaeao went unclaimed on waivers and reverted to injured reserve, where the Eagles have compiled an impressive list of talent. On a separate list — the non-football-injury list — is 2017 starting defensive tackle Tim Jernigan, who has been sorely missed. Jernigan underwent offseason back surgery and it is unclear when he might return. Behind Ngata, the Eagles now have Hector and former Raider Treyvon Hester, who joined the practice squad the day after the Eagles' opener and was promoted to the 53-man roster on Oct. 2. Hester played 11 snaps against Minnesota and 15 against the Giants. He played in the first 14 games of 2017 for the Raiders, with one start, before suffering an ankle injury. He was a seventh-round Oakland draft pick that year, from Toledo. One thing that made Jernigan valuable was that he was good enough to take some of the opponent focus off Fletcher Cox. Cox is playing very well this season, but the Eagles haven't had a really productive tackle next to him. Michael Bennett and Brandon Graham can both slide inside on passing downs. Listed as out for Sunday's game are corner Sidney Jones, safety Corey Graham and running back/returner Darren Sproles, all with hamstring issues, plus a couple of key special teams guys, Nate Gerry (ankle, knee) and D.J. Alexander (quadricep). Left tackle Jason Peters (biceps) and right tackle Lane Johnson (ankle) were limited practice participants Friday but are expected to be able to play.